CARHARTT DETROIT photo picture art print photograph for sale. 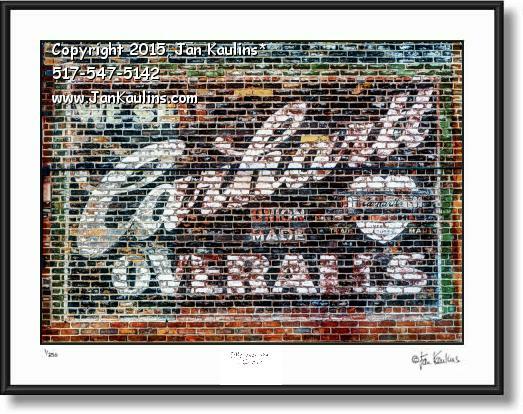 This vintage old CARHARTT DETROIT advertising mural sign photo picture iconic art print for sale has lasted for many years on the side of this old brick building on the East side of Detroit. Though some of the paint is peeling, the message is still boldly there of this Detroit landmark business that has been in Detroit for many years. Carhartt, Inc., is a U.S.-based clothing company founded in 1889 that focuses on work clothes. It is still a family-owned company, owned by the descendants of company founder Hamilton Carhartt, with its headquarters in Dearborn, Michigan. It recently opened it's first retail outlet in Detroit. The multiple bracketed exposure technique used by artist/photographer Jan Kaulins brings out the color and the textured detail of this iconic Detroit image. This is a wonderful image of some of Detroit's proud manufacturing history. It is part of Jan's Detroit Ghost Signs photo series.